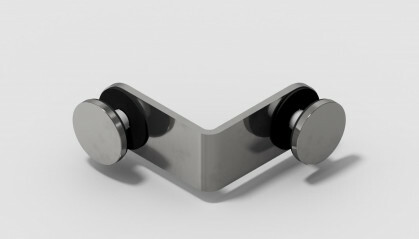 Balustrade Components UK manufacture and supply a wide range of standard structural fittings for glass. 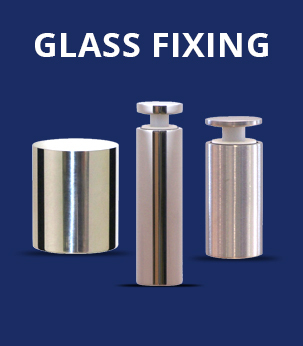 If you do not find what you require then we can design and manufacture a bespoke glass fixing solution for you. Our product range includes weld on panel glass brackets. These are available as mild steel glass brackets, grade 304 stainless steel glass brackets and grade 316 stainless steel glass brackets. They can also be supplied with mild steel fixing plates and stainless steel glass bosses. Our standard GD40 glass brackets are 40mm wide and our GD50 glass brackets are 50mm wide. They are for welding to conventional balusters on horizontal runs. These products require a 25mm diameter hole in the glass in all cases. Our standard glass brackets are designed for 8mm, 10mm or 12mm toughened glass and 13.5mm laminated glass. Our heavy duty range is designed for 15mm, 17.5mm, 19mm, 21.5mm, 23mm and 25mm glass. 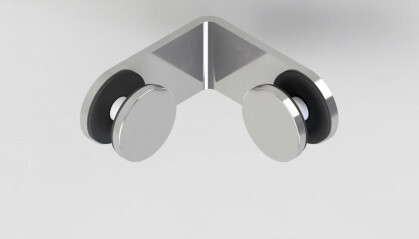 Our new GE40 and GE50 Glass Bracket design is a low cost option to the GD40 and GD50 Glass Brackets. This new products used a Dome Nut to terminate the M8 fixing instead of one of our standard Glass Bosses.